Get the free Sanctum Secorum #25 Companion HERE! Welcome to the Sanctum Secorum podcast. 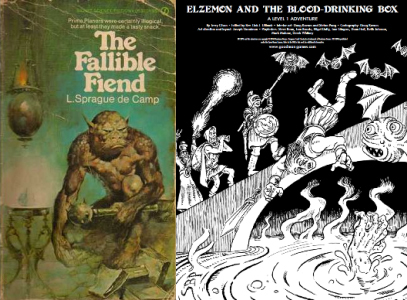 Tonight we discuss L Sprague de Camp’s satirical fantasy novel The Fallible Fiend as well as Terry Olson’s adventure Elzemon and the Blood-Drinking Box. Get the free Sanctum Secorum #24 Companion HERE! Holger Carlsen is an American-trained Danish engineer who joins the Danish Resistance to the Nazis. At the shore near Elsinore he is among the group of resistance fighters trying to cover the escape to Sweden of an important scientist (evidently, the nuclear physicist Niels Bohr). With a German force closing in, Carlsen is shot – and suddenly finds himself carried to a parallel universe, a world where Northern European legend concerning Charlemagne (“The Matter of France”) is real. This world is divided between the forces of Chaos inhabiting “Middle World” (which includes Faerie) and forces of Law based in the human world, which is in turn divided between the Holy Roman Empire and the Saracens. He finds the equipment and horse of a medieval knight waiting for him. The shield is emblazoned with three hearts and three lions. Welcome to the Sanctum Secorum podcast. 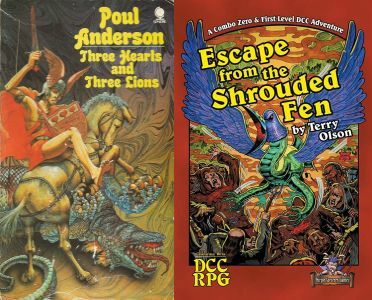 Tonight we discuss Poul Anderson’s seminal work Three Hearts and Three Lions as well as Terry Olson’s new adventure Escape from the Shrouded Fen. We like one of these far more than the other…can you guess which? Get the free Sanctum Secorum #20 Companion HERE! Welcome to the Sanctum Secorum podcast. 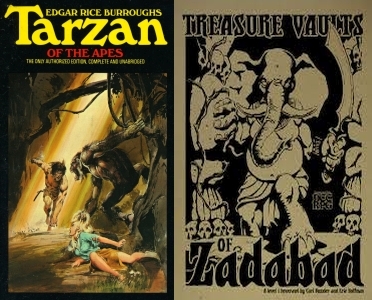 Tonight’s episode takes you into the wilds of the Africa of Edgar Rice Burroughs with Tarzan of the Apes! Get the free Sanctum Secorum #15 Companion here! “Kamandi is the last survivor of the human outpost in the “Command D” bunker near what was once New York City. “Kamandi” is a corruption of “Command D”; it is unclear if Kamandi ever had any other name. Raised by his elderly grandfather, Kamandi has extensive knowledge of the pre-Disaster world, thanks to a library of microfilm and old videos, but he has spent most of his time inside the bunker, and is unaware of the state of the world outside. When his grandfather is killed by a wolf, Kamandi leaves the bunker in search of other human outposts. He soon discovers that the only other intelligent humans left on Earth are Ben Boxer and his friends Steve and Renzi, a trio of mutants genetically engineered to survive in Earth A.D. He also makes a number of animal friends including Dr. Canus, the canine scientist of Great Caesar (leader of the Tiger Empire) and Caesar’s teenage son Tuftan. Later additions to the cast included the alien woman Pyra, the girl Spirit and the consulting detective Mylock Bloodstalker and his associate Doile. Even the most sympathetic animals however are nonplussed by Kamandi and Ben’s ability to speak. Welcome to the Sanctum Secorum podcast. 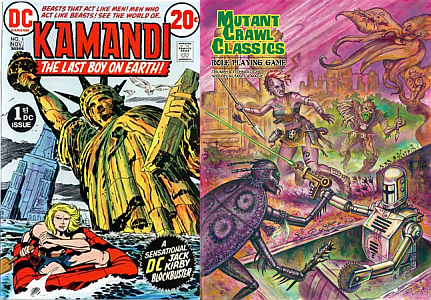 In this episode we get to unite the work of the immortal Jack Kirby with special guest Jim Wampler’s long awaited Mutant Crawl Classics! In addition, we have bonus content to bring to your DCC game while you wait that shiny new MCC book…after the jump! Get the Sanctum Secorum #14 Companion here! Conan, following legends of this treasure, has travelled to Keshan and offered his services to train and lead Keshan’s army against their neighbour, Punt. However, Thutmekri, a Stygian rogue with similar intentions, and his Shemitish partner, Zargheba, also arrive in the country with an offer of a military alliance with another of Punt’s neighbours, Zembabwei, with some of the Teeth to seal their pact. The high priest of Keshan, Gorulga, announces that a decision on the matter can only be made after consulting Yelaya, the mummified oracle of Alkmeenon. This is all the treasure hunters require. Zargheba joins Gorulga in his expedition while Conan travels ahead of them. Welcome to the Sanctum Secorum podcast. In this episode we delve into the character for whom Sword & Sorcery is named, that mightiest of barbarians, Conan! In addition, we have bonus content to bring to your game. How about a new adventure from David Baity?! That and more…after the jump! Get the Sanctum Secorum #12 Companion here! From the world beyond–or past–time Kothar comes. From out of the deepest, most violent recesses of mankind’s collective memory, Kothar the gigantic barbarian strides, the enchanted sword Frostfire glittering in his mighty hand. Lusty, hot-blooded, masterful, unafraid of things real or unreal, Kothar dominates the misty, bloody world before recorded time. Yet, though Kothar’s world existed in another age–perhaps another dimension–it springs vividly to life. Mapped, charted, chronicled, Kothar’s fantastic world suddenly becomes real–the sorcerers, dragons, witches, evil potions, unspeakable monsters. And Kothar, an epic hero for any age, overshadows everything. Welcome to the Sanctum Secorum podcast. 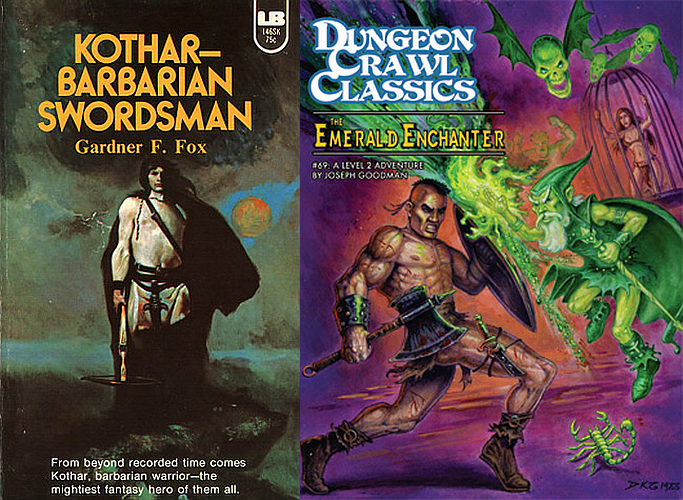 In this episode we look at the world of Gardner F Fox’s Kothar: Barbarian Swordsman. In addition, we have bonus content to bring to your game: classes, magic items and so much more…after the jump. Get the Sanctum Secorum #11 Companion here! Skeeve, a magician‘s apprentice and wannabe thief from the dimension Klah, tries to learn the basics of magic from Master Magician Garkin for several months but to no avail. Skeeve can do little more than float a feather or light a candle using magic. Wanting to convince Skeeve that being a thief is not as good as being a magician, Garkin summons a demon. During the summoning an assassin barges into the hut, and Garkin and the assassin kill each other. Skeeve is left alone with the demon. To Skeeve’s surprise the demon politely introduces himself as Aahz. Aahz explains that demon is slang for Dimension Traveler. He further explains that there are thousands of dimensions with different races in them, and that he is from the dimension of Perv, making Aahz a Pervect, while Skeeve is a Klahd. Aahz is a master magician like Garkin but loses his magical powers during the summoning ritual (due to a practical joke played on him by Garkin) and becomes stranded in Klah. Aahz volunteers to take Skeeve on as his apprentice and teach him magic. The pair then embark on a series of misadventures. Welcome to the Sanctum Secorum podcast. 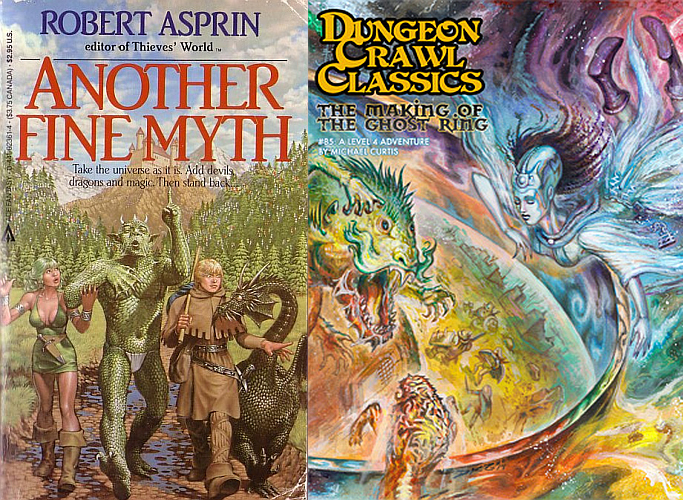 In this episode, in honor of April 1st, we’ll take the opportunity to look at the lighter side of fantasy with Robert Asprin’s Another Fine Myth! Get the Sanctum Secorum #10 Companion here! The third story in Clark Ashton Smith’s Averoigne cycle, the story takes place in the fictional French town of Averoigne. Much as Lovecraft based Arkham on Boston, Clark Ashton Smith’s Averoigne is based on the very real Auvergne region. 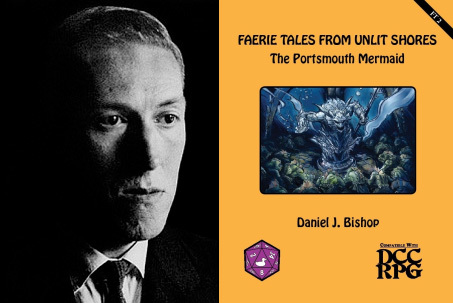 Even more closely tying this story to our previous episode, H. P. Lovecraft wrote a story “Out of the Aeons” that also intertwines with this fictional province as have a number of other authors. Certainly this is a region filled with potential. All told Clark Ashton Smith left us with eighteen pieces, some incomplete, others mere outlines, of events transpiring in this area. The story itself involves a stonecutter, shunned and feared by the people of the area, whose affections towards a local girl are spurned, if she recognizes he exists at all. Hired to create a pair of gargoyles for the new cathedral, he cuts two pieces of true masterwork but, in doing so, pours all of his negativity, hatred and lust into their creation. Infused with these black emotions, the gargoyles come to life and wreak havoc leaving death in their wake. Welcome to the Sanctum Secorum podcast. 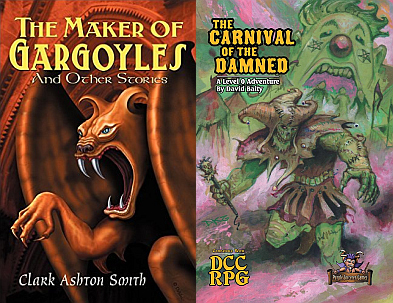 In this episode we examine a work by famed author Clark Ashton Smith and match it Carnival of the Damned by the Sanctum’s own David Baity. 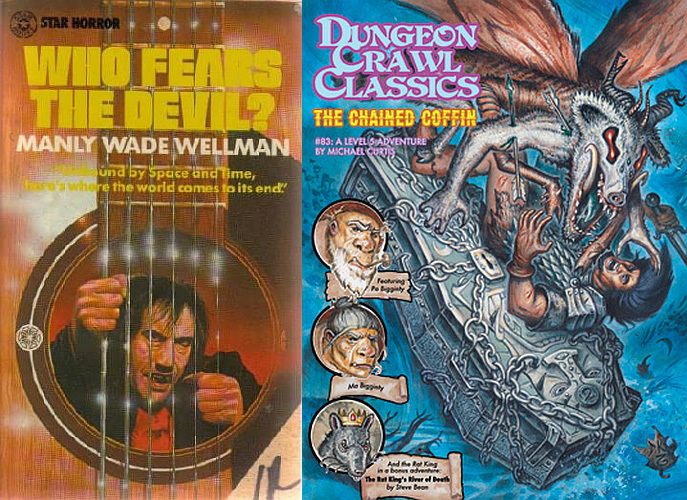 Episode #07 – Who Fears the Devil? There’s a traveling man the Carolina mountain folk call Silver John for the silver strings strung on his guitar. In his wanderings John encounters a parade of benighted forest creatures, mountain spirits, and shapeless horrors from the void of history with only his enduring spirit, playful wit, and the magic of his guitar to preserve him. Manly Wade Wellman’s Silver John is one of the most beloved figures in fantasy, a true American folk hero of the literary age. Welcome to the Sanctum Secorum podcast. 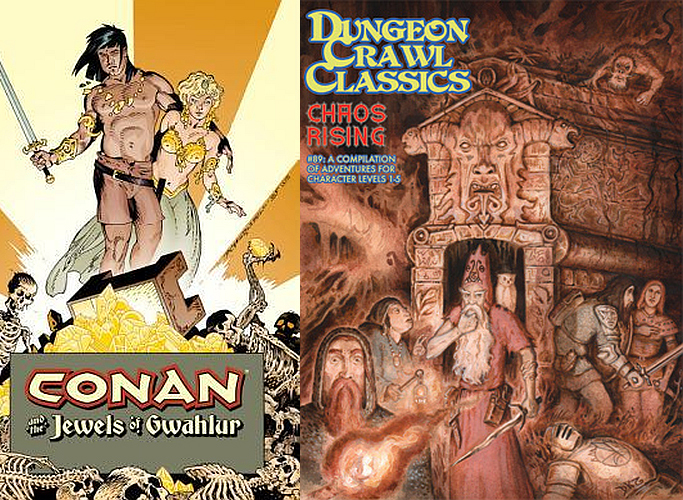 In this episode, we are joined by author Michael Curtis as we examine the stories that inspired an entire setting and boxed set for DCC RPG, and a legendary piece of Appendix N literature. There is so much to discuss that our format was literally bursting at the seams and so we present the episode with 10 extra minutes of content! In addition, we have bonus content to bring to your game: patrons, classes, and so much more…after the jump.